We’ve talked about a few hills that are quieter than the famously chaotic Kampala city center. Munyonyo takes the cake as the most peaceful outskirt hill in Kampala. With lush views of the lake all over the hill and lots of undeveloped land, Munyonyo boasts beautiful homes and luxury accommodation. 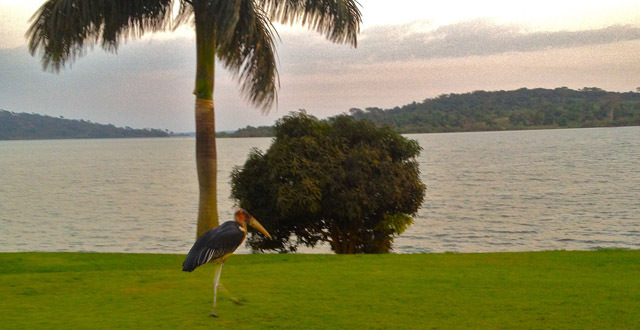 There isn’t much to do in Munyonyo outside of the hotels. But even if you’re not a hotel guest, it’s often nice to escape the city and enjoy the pools and restaurants at these resorts. There is also opportunity to find fun activities on the lake such as sailing, horseback riding and fishing. Hotels in Munyonyo are peaceful and beautiful. If you’re staying in Munyono we recommend you go somewhere with a view of the lake, since you’re so close. Speke resort is a favorite. Houses and apartments in Munyonyo are often luxury and take some research to find. Palm Villas – A real estate project launched in conjunction with the Commonwealth Resort, in preparation for the Commonwealth Heads of Government Meeting in 2007. A private, gated community with limited, luxury accommodations. Waterfront Apartments Kampala – for 2-3 bedroom apartments, fully furnished. Beautiful marble bathrooms. Secure facilities with parking and laundry services. An adjacent recreation club has a pool, sauna, gym, steam room, and message. $2,300-$2,500 per month. $140-$160 per day. Commonwealth Resort – Five-star resort originally built to house prominent politicians during the Commonwealth Heads of Government Meeting in 2007. There are lots of business and conference facilities. Rooms range from $160-$500 per night. The resort has beautiful pools, beach access and tons of activities (see above). Speke Resort & Conference Center – Beautiful luxury hotel, multiple pools, huge gym. Several restaurants and cafes. Standard rooms and suites as well as simple apartment style accommodations and beautiful cottages are available. Rooms are $125-$200 per night and cottages are $500 per night. Various activities at the Speke can be seen above. Cassia Lodge – A smaller lodge with only 20 safari style rooms. Cassia Lodge has incredible views and an exceptional bar and restaurant with balcony seating. Gorgeous pool and grounds. Rooms cost $130-$170 per night. All of the Munyonyo hotels have various bars to be lounged in at night, otherwise Munyonyo isn’t really a nightlife destination. The Speke Resort, however, will sometimes have beach parties with live music on the banks of the lake. There are lots of recreations options in this area. The Commonwealth Resort offers day trips to Bulago Island, fishing trips, bird-watching boat tours, speeedboat trips, horseback riding (learn/compete/local safari), swimming pools, sailing (learn to sail a Lazer), a gym, trips to Chimp Island, and sundowner boat trips. The Speke resort also offers a swimming pool, a gym, horseback riding classes and a port with various boats that the hotel can coordinate for use. Or for some paintball fun (totally what you had in mind when you moved to Kampala, I’m sure! ), check out Kamooflage Outdoor Adventures who run a small, fun and colorful paintball course just down the road from the Speke Resort. Team games are around $10 per person. If yoga is your thing then Simply Yoga offers small classes and personalized yoga instruction and Sivananda Yoga (only $6 per class or $48 for a two-week pass). There isn’t much shopping in Munyonyo but Super Supermarket can provide for most of your basic grocery needs. There are ample places to sit and enjoy coffee or tea at the Speke Resort, Commonwealth Resort and Cassia Lodge. But otherwise we haven’t found cafes in Munyonyo. There are a few restaurant choices, however. The Stables Restaurant – Located on an upper level next to the Equestrian Centre at the Speke Resort. Beautiful views, delicious Indian food and eclectic combination of other dishes. You can also order food and drinks from The Stables while sitting by the pool. Weekend buffet breakfast, a really nice quiet breakfast or brunch destination. The Speke Resort – In addition to The Stables Restaurant, the Speke has a restaurant in it’s main lobby that opens out onto a deck and fish pond in the rear. The ambiance is nice, but best on the deck. It has similar international cuisine with extensive Indian options. Cassia Lodge – Romantic, very relaxed safari lodge ambiance with beautiful views and great international cuisine. Located in Bunga, which is a neighbor to Munyonyo. Samurai – Fun sushi and Japanese restaurant in Bunga. Great, sort of kitsch (in a good way) ambiance with low tables, floor pillows and big windows. Munyonyo has few healthcare options. We advise traveling to International Health Kampala (IHK) in Muyenga or The Surgery Hospital in Kololo for your medical needs. Thanks for your comment, Gustav! Anyone else know of anything we’ve missed? On any of the area guides? That’s what the comments are for! We get things rolling and give everyone a place to share their tips for each area. So don’t be shy! I forgot to mention the Iranian restaurant next to the Gaz petrol station a bit further towards Speke Resort from Miki’s Pub. Good pizzas and Iranian specialties. You have done a good job. Looking forward to your reviews on Lubow and Naalya. your research is lacking. waterfront apartments are no where near munyonyo. you got misled by a listing on some website. hehehe! waterfront apartments are in lower muyenga. the recreation club that you are referring to is Sebo gardens. again no where near Munyonyo.